Rizzi-Albarea Villa is the most ancient Venetian Villa in the "Riviera del Brenta" area, in a strategic position between two beautiful art cities: Venice and Padua, but also near other wonderful cities: Treviso, Vicenza, Verona and at only 2 kms from the Dolo highway exit, along the Milan-Venice highway. Millenary oasis of peace and very charming, Albarea Villa is in the middle of the green nature and it is surrounded by two hectares of park. 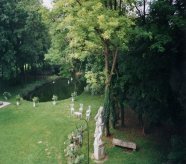 The garden is a romantic apotheosis of climbing roses, old aged trees, ancient statues of wood divinities, birds of many kinds, herons, swans and ducklings that glide into the water of a gorgeous lake with a small island, bridges and a little panoramic tower. And all around there are flower beds, gazebo, wisteria, roses, jasmines and a beautiful swimming pool.